Several bugs resemble seeds, and some grow in large sunflower seed-shaped pupae or exoskeletons. Bugs, like humans, wear costumes to distract the viewer. In the insect’s case, however, the costume serves a more serious purpose, protecting it against predators by making the bug look larger or better protected than it really is. Members of the stink bug family all carry shells that closely resemble sunflower seeds. Although the common green stinkbug would not be mistaken for a sunflower seed, the domestic black stink bug and its Asian cousin, the brown marmorated stink bug, closely resemble black and variegated sunflower seeds. 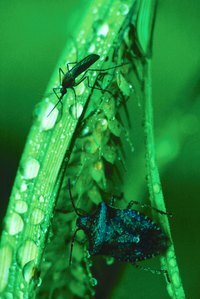 The brown marmorated stink bug first appeared in Pennsylvania in 1996, according to Rutgers University’s New Jersey Agricultural Experiment Station, and has since spread throughout the eastern United States. Although nymphs go through four stages of growth, or “instars,” the adult bug is most sunflower seed-like in appearance, which is shield-shaped and tapered to a dark point. Bagworms target a wide range of evergreen plants and other materials. Larvae construct ovoid cases resembling sunflower seed shapes, but outdoor bagworm cases are shaggy. The plaster bagworm, an indoor pest, builds a bag that could be mistaken for a white sunflower or pumpkin seed. Female bagworms never leave their bags, but males emerge as moths to travel from bag to bag, looking for a female mate. Pantry moths and clothes moths also build seed-like cocoons, earning them the classification of “case-making” bugs. The larval forms of these moths do the damage, consuming grain and fabric. Pantry moths’ cases are woolly, but clothes moths build cases that mimic the texture and colors of the fabric they consume. Given a black and white garment and enough time, a case-making clothes moth may very well create a case that resembles a black or confectionery sunflower seed. Several but not all adult beetles in the family Anobiidae have sunflower seed shapes. Beetles of the genus Tricorynus, including T. palliates, T. congruous and T. texanus, grow shiny black and brown exoskeletons shaped like sunflower seeds. T. lucidus White, in contrast to its name, resembles a black sunflower seed. Several species of the genus Trogoderma and other beetles are fully seed-shaped as adults. Colors vary from solid green, black or brown to marbled brown and gray.